Well folks, we saw another good night of racing at “Arthur Strike Park” Home of the Cairns International Speedway on Saturday 15th September 2018. It was a good night for The Collins Crew with Johnno returning after a few months break & Bev was here helping the boys out & using some of his tricks on Darrynos #11. National 4cylinder Sedans had a good field of 8 cars & every race the pole position was left free as a mark of respect for fellow racer, volunteer & life member #47 Wendy Fisher who sadly passed away on 10th August 2018. Heat 1 Darryn started 3 & finished 2nd. Heat 2 started 6 finished 2. Heat 3 started 5 finished 1. Feature started outside pole finished 1. Congratulations #11 Darryn Collins 2nd,#19 Ian Turner 3rd, #14 Bill Temperly. 4th, #14 Buddy King. 5th,#25 Nathan Hewitt. #38 Brandon Wyatt had a very crook running car after only 4 laps in the first heat which ended his night. Matthew Woody Woodham broke a drive shaft in turn 4 on the first lap of heat 3 but had won both heats 1& 2 so that put a spanner in the works after a really good start to his night. And I don’t know what happened to #33 Colin Cornaggias car not to start the feature. #15 Christopher Ross‘ night was cut short with gearbox problems. Oh dear as if time between meetings wasn’t long enough & to only get 8 laps in & have to put it in the trailer is hard indeed. I don’t know what happened to #11 Dan Hethorn. Heat 2 started 8 finished 4th. Johnno almost lost it turns 3 & 4 but managed to catch it before he spun out. #6 Steven Manly won this one. Heat 3 started 6 finished 1. Feature started 4 results. Congratulations #21 Johnno Collins. 2nd, #T25 Adam Jorgensen. 3rd, #6 Steven Manly, 4th, #8 Scott Vella, 5th, #39 Jason Barnard, 6th #T79 Richard Ings, 7th #11Dan Hethorn, 8th #T20 Jason Cummins. DNS #4 Dave Manly had alternator problems. Johnno ended up with a cone on the dashboard that he had to grab & throw on the floor to get it out of the way in the feature. Also we missed #69 Graham Kleinhans on the track even he was there to check out the meeting & look forward to see him on the track next meeting. I must also thank our pit crew Old Boy, Bevan & Bretto for all their help at the track & also in the shed. We missed you Ryan Wilkins hope to see you next meeting. A big THANK YOU to the visiting drivers from Townsville. It makes the night so much better to have some more cars on the track. The Tom Casey Memorial trophy Congratulations #Q1 Kaydon Iverson. 2nd, #NQ93 Lexi Underwood, 3rd, #34 Jared Desmares, 4th, #96 Tessa Underwood. 5th #NQ46 Brett Sciban. #46 Alan Iverson had a rollover in turn 3 on the first lap so glad he walked away unhurt. Junior Formula 500s feature won by #NQ39 Brodie Davis. 2nd, #NQ3 Jay Howell. Cairns Sprint Sedans feature. Congratulations to #43 Geoff Roeser, 2nd, #54 Paul Carr. 3rd, #113. Chris Zaher. & #19 Adrian Maskell only completing 3 laps. 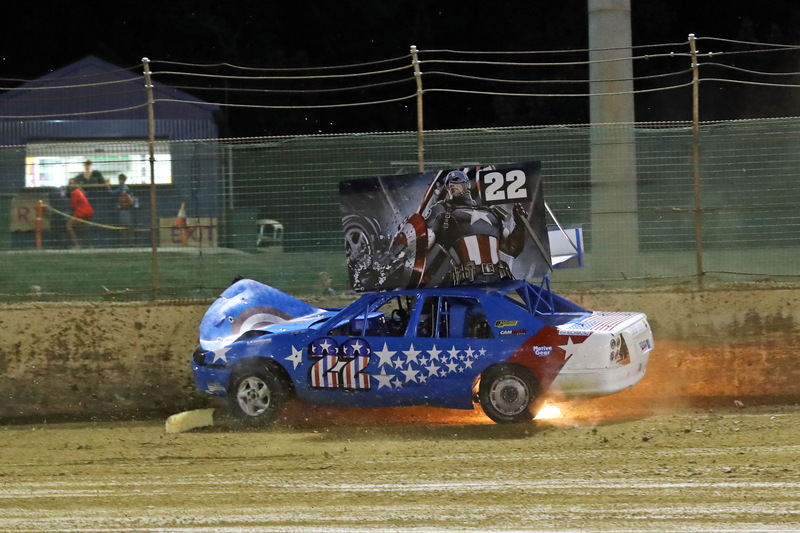 Heat 2 saw #22 Peter Butler hit the fence big time on turn 3/4 ending the night for him. I still haven’t worked out the Dirt Karts yet but Congratulations to all the winners of their divisions. As always we must thank all the volunteers & club members that make it all possible. The next meeting has been moved to 27 October 2018. Hope to see you there.